Introducing Drum Werks XVII: Signature Classic Rock Drum Loops of Led Zeppelin, AC/DC, Van Halen and More. 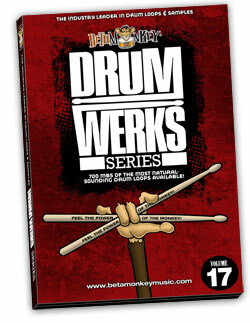 Drum Werks XVII delivers classic rock drum loops for some of the most iconic rock drum tracks ever. You know the famous grooves we’re talking about. These are the grooves we emulated here on Drum Werks XVII, with every loop inspired by rock’s greatest drummers and performances. This sample library is an unrelenting homage to the great signature drum tracks that made rock an unstoppable musical force with powerful, unrelenting, and timeless grooves. If you’re after rock drum tracks in the styles of Led Zeppelin, AC/DC, Jimi Hendrix, ZZ Top, Van Halen, and more, Drum Werks XVII has those legendary acoustic rock grooves you’ve always wanted. For all you classic rockers out there, Drum Werks XVII will get your tracks rocking with truly legendary drum parts. Don’t just settle for “beats like Bonham” – it’s time for authentic grooves that actually capture the rhythmic DNA of the masters. All grooves were tracked by one of L.A.’s most in-demand studio drummers. Unquestionably, Drum Werks XVII takes it over the top with the classic rock grooves inspired from some of rock’s most recognizable and sought-after beats. Get the undisputed holy grail of classic rock drum tracks by Led Zeppelin, AC/DC, Hendrix, ZZ Top, Toto, and Van Halen into your music today. 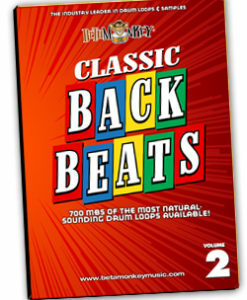 Not just any ‘classic rock drum loops’ You get the most iconic rock beats ever recorded! Most would name John Bonham, Alex Van Halen, Phil Rudd, Mitch Mitchell, and Jeff Pocaro when creating a lot of the most recognizable and iconic drum grooves of all time. These are some of the drummers who laid down the most instantly-recognizable rock grooves ever recorded, the types of drum parts you know within seconds of hearing them. And, that’s exactly what this rock drum loops library is all about. In addition to the legendary grooves captured, we’ve created highly-efficient “Groove Sets.” These include all the essential elements for drag and drop song construction (intro fills, verse, pre-chorus, chorus, bridge loops as well as endings). In short, you have all the right tools to build new drum tracks quickly and easily. For many songs, we’ve also included the full source takes to create many more loops and variations. This powerful rock sample collection was created to capture the spirit and essential signature licks of the songs – not note-for-note or lick-for-lick renditions. While you can certainly create your own cover versions of the featured songs, we want you to use these grooves to create new musical works, ones inspired by the greats but hopefully in new and wonderfully unique directions. Additionally, you get a consistent drum sound (and compatible with any library from the L.A. Rock Essentials Series) and longer loops (four and eight bars). You get the realism your music deserves and the signature grooves behind some of rock’s most enduring classic tracks. You get the iconic grooves you love in your music. That’s what Drum Werks XVII is all about. Signature Classic Rock Drum Patterns: Want some of the most sought-after, signature drum grooves ever recorded? 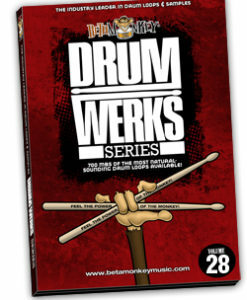 Drum Werks XVII is what you need. We captured the legendary drum tracks of Led Zeppelin, AC/DC, Jimi Hendrix, ZZ Top, and Van Halen. This collection of rock drum loops is for all songwriters looking to rock out. Create your own brand of classic or modern rock built on the same rhythmic foundations as the rock masters. With a wide range of classic rock artists covered, these are the classic rock drum breaks you need. Classic Rock DNA Ready for Your Music: While these loops capture the essence of some of the most recognizable and iconic rock drum beats, it’s your turn to create exciting, new music using the rhythmic DNA of the classic rock drum gods. With these timeless grooves as the foundation, it’s easy for anyone to build new hard-rocking tracks with confidence. Cohesive Drum Sounds, Consistent Drum Mix: As part of the L.A. Sessions, we recorded all drums in one recording session (all grooves, fills, samples are sonically-matched). Of course, we made slight tonal adjustments based on the artists covered. We dampened the snare for AC/DC tracks, and allowed for an open, resonant kick for the Led Zep grooves. But, you can mix and match all loops or add single hit samples as needed. Maximum versatility and productivity – that’s why Beta Monkey pioneered the single-session drum sample concept. Fully-Sampled Drum and Cymbal Samples: Build even more great grooves with the entire collection of drums and cymbals recorded on Drum Werks XVII. Compatible with all of the L.A. Sessions drum libraries. 312 (698 MB 24 bit WAV; 492 MB 16 bit WAV) original, license-free 16-bit, 24-bit ACIDized WAV, APPLE LOOPS/AIFF and REX2 loop formats. ALL ACIDized WAV, APPLE, and REX2 formats included for download and hard copy DVD purchases.